WING.ae co-founders Sanjar Samiev and Muzaffar Karabaev. Despite a tech-savvy population and strong fundamentals, the Middle East region remains one of the underserved e-commerce markets worldwide. While this could be attributed to several reasons, a factor that is widely regarded as key is inadequate logistics infrastructure. It’s also a structural gap that startup WING.ae’s team zeroed in on while considering business ideas for their venture. “Discussion went around [about] taxi app, rent-a-car mobile app, and carpooling/sharing technology, but once we did a bit of research, [we realized] at the time there was very little [tech solution] in delivery and logistics,” says Muzaffar Karabaev, co-founder and CEO, WING.ae- an on-demand delivery and courier marketplace. Having started operations in early 2016, just few months into its launch, the logistics marketplace has managed to raise an undisclosed amount of seed funding from the region’s e-commerce giant Souq.com. 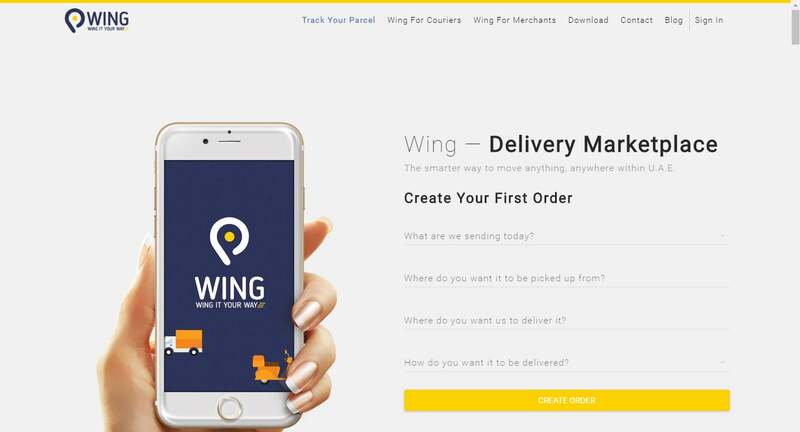 WING.ae’s mobile and web-based service allows individuals to compare rates among UAE carriers, and handles “small delivery tasks” for them. The business also has a B2B side to it, and works with merchants, who are looking for technological support to manage deliveries, and payments. Explaining how the startup managed to attract Souq’s interest, Karabaev says that their offering fits with Souq’s long-term growth strategy. “When they [Souq] grow their business, they can rely on our shipping solutions without having multiple relationships, or building their own fleet,” he notes. He adds that it’s also personally a great benefit for the WING.ae team to be mentored by Souq.com’s founder and CEO Ronaldo Mouchawar, and CFO Asif Keshodia. According to Karabaev, over 50% of the delivery vehicles in the UAE operate with less than half their capacity utilized currently, and more than 30% of the vehicles travel with empty cargos. The delivery marketplace aims to use technology to enable carriers make use of this spare capacity, cut down on emissions, and increase profitability. With the co-founders -Karabaev and Sanjar Samiev- having spent just nine months in building the tech framework, interesting days await the startup, which claims to have features including “international shipping, COD [cash on delivery] balance management, and promotions,” all under development. Co-founder Karabaev says that the startup’s main priority is to improve their “order allocation algorithm” for couriers, and improve “API for merchants/customers.” The team is also in the process of growing their network of courier services. “We see that the same day on-demand shipping is either very expensive or non-existent in UAE, apart from restaurant delivery. We see huge potential in this area,” he notes. Ronaldo Mouchawar, founder and CEO, Souq.com. Image credit: Souq.com. What are Souq's reasons for investing in WING.ae? What competitive edge does Souq see in WING.ae’s solution?